Katherine of Aragon (Alcalá de Henares, December 16, 1485 – January 7, 1536), Castilian Infanta Catalina de Aragón y Castilla, also known popularly after her time as Catherine of Aragon, was the first wife and Queen Consort of Henry VIII of England. Henry VIII tried to have their 24-year marriage annulled in large part because all their male heirs died in childhood, with only one of their six children, Princess Mary (later Queen Mary I) surviving as heiress presumptive. At a time when there was no established precedent for a woman on the throne. Pope Clement VII refused to allow the annulment of Henry's marriage to Catherine. This set off a chain reaction that led to Henry's break with the Roman Catholic Church and his subsequent marriage to Anne Boleyn in the hope of fathering a male heir to continue the Tudor Dynasty. Born in Alcalá de Henares (30 km from Madrid) in 1485, Catherine was the youngest surviving child of Ferdinand II of Aragon and Isabella I of Castile. Through her mother, she descended from Catherine of Lancaster, her namesake and the source of her auburn hair. The elder Catherine was a daughter of John of Gaunt and granddaughter of King Edward III of England. Catherine's sister, Joanna the Mad, was six years elder to Catherine. Consequently it was Joanna who became queen of Castile upon their mother's death rather than Catherine. When she was 16, Catherine married Prince Arthur, the eldest son of Henry VII, on November 14, 1501. As Prince of Wales, Arthur was sent to Ludlow Castle on the border of Wales to preside over the Council of Wales, and Catherine accompanied him. A few months later, they both became ill, possibly with the sweating sickness which was sweeping the area. Catherine herself nearly died, but she recovered to find herself a widow. Catherine testified that, because of the couple's youth, the marriage had not been consummated. Pope Julius II soon issued a dispensation so that Catherine could become betrothed to Arthur's younger brother, the future Henry VIII of England. 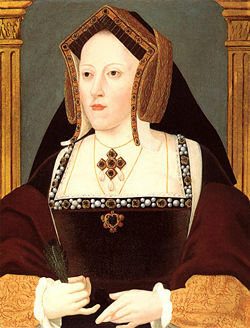 Catherine's marriage to Henry VIII did not take place until eight years later, after Henry ascended the throne in 1509. It was held on June 11, followed by the coronation on June 24, 1509. Both as princess of Wales and as queen consort, Catherine was extremely popular with the people. She governed the nation as regent while Henry invaded France in 1513. Henry VIII was apparently happily married to Catherine at first, despite squabbles with her father over the payment of her dowry. Although he was not faithful, they were married had several children over 18 years, but only one girl survived. As she approached menopause, he became seriously worried about getting a male heir to his throne. Catherine's first child, a daughter, was stillborn in 1510. Prince Henry, Duke of Cornwall was born in 1511, but died after 52 days. Catherine then had another stillborn girl, followed by another short-lived son. On February 18, 1516 at the Palace of Placentia in Greenwich, London, she gave birth to a daughter named Mary (later Queen Mary I of England). Her final pregnancy ended with a stillborn girl in November 1518. A male heir was essential to Henry. The Tudor dynasty was new, and its legitimacy might still be tested. The last female to inherit the English throne was Empress Matilda in the twelfth century, daughter of Henry I of England. 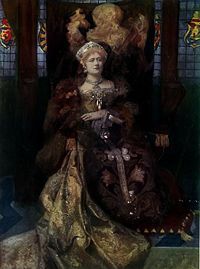 She had to fight a long civil war against barons who denied a woman could reign in England and ultimately failed to secure the throne. The Wars of the Roses (1455 – 1485), revived English memories of the costs of such struggles. In 1520, Catherine's nephew Charles V paid a state visit to England. The queen urged the policy of gaining his alliance rather than that of France. Immediately after his departure, May 31, 1520, she accompanied King Henry to France on the celebrated visit to Francis I, remembered (from the splendors of the occasion) as the Field of the Cloth of Gold. Within two years, however, war was declared against France and the Emperor once again made welcome in England, where plans were afoot to betroth him to Henry and Catherine's daughter Princess Mary. At this point Catherine was not in physical condition to undergo further pregnancies. Due to the lack of a male heir, Henry claimed that he became convinced that his marriage was cursed. He sought confirmation from two verses of the biblical Book of Leviticus, which said that, if a man marries his brother's wife, the couple will be childless. He chose to believe that Catherine had lied when she said her marriage to Arthur had not been consummated, therefore making their marriage wrong in the eyes of God. He therefore asked Pope Clement VII to annul his marriage in 1527. The pope procrastinated on the issue for seven years without making a final judgment. Partially this was because allowing an annulment would be admitting that the Church had been in error for allowing a special dispensation for marriage in the first place. In addition, the pope was a virtual prisoner of Catherine's nephew, Charles V, who had conquered Rome. Henry separated from Catherine in July 1531. In January 1533, he married one of Catherine's former ladies-in-waiting, Anne Boleyn, sister of his former mistress Lady Mary Boleyn. Henry finally had Thomas Cranmer, whom Henry had appointed as Archbishop of Canterbury, annul the marriage on May 23, 1533. Five days later Cranmer declared the marriage of Henry and Anne to be valid. To forestall an appeal to Rome, which Catherine would have almost certainly won, Henry had Parliament pass the Act of Supremacy, illicitly repudiating papal jurisdiction in England, making the king the head of the English church, thus beginning the English Reformation. Until the end of her life, Catherine of Aragon would refer to herself as Henry's only lawfully wedded wife and England's only rightful queen. Her faithful servants continued to address her by that title. In 1535, she was transfered to the decaying Kimbolton Castle in the wilds of Huntington. Confining herself to one room, leaving it only to attend mass, Catherine prepared to meet her end. While she was permitted to receive occasional visitors, she was forbidden to ever see her daughter Mary. She was also forbidden to communicate with her, but discreet sympathizers ferried secret letters between mother and daughter. Henry offered them both better quarters and the company of one another if only they would acknowledge Anne Boleyn as his new queen. Neither did. The hour of my death now drawing on, the tender love I owe you forceth me, my case being such, to commend myself to you... For my part, I pardon you everything, and I wish to devoutly pray God that He will pardon you also. For the rest, I commend unto you our daughter Mary, beseeching you to be a good father unto her, as I have heretofore desired... Lastly, I make this vow, that mine eyes desire you above all things.—Katharine the Quene. Catherine died, aged 51, at Kimbolton Castle, on January 7, 1536 and was buried in Peterborough Cathedral with the ceremony due to a Princess Dowager of Wales, not a queen. Catherine's embalmer confessed to her doctor that Catherine's heart had been black through and through, which led many of her supporters to spread the rumor that Anne Boleyn had poisoned her (Lofts 1977, 139). Henry did not attend the funeral, nor did he allow Princess Mary to do so. Catherine was the only one of Henry's wives who lived to see her fiftieth birthday. Visitors to Peterborough Cathedral can still visit Catherine's tomb, which is frequently decorated with flowers and bears the title 'Katharine the Queen.' Peterborough is twinned with the Castilian city of Alcalá de Henares, her birthplace. Catherine was the youngest child of Ferdinand II of Aragon and Isabella I of Castile. 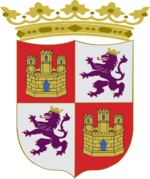 Her older siblings were Isabella, Princess of Asturias; John, Prince of Asturias; Joan I of Spain; and Maria of Castile and Aragon, Queen of Portugal. She was an aunt to Charles V, Holy Roman Emperor, John III of Portugal and their wives; Ferdinand I, Holy Roman Emperor and Henry I of Portugal. Catherine was a granddaughter of both John II of Castile and John II of Aragon. She was descended from the English royal house through her great-grandmother Katherine of Lancaster and her great-great-grandmother Philippa of Lancaster from another line, both daughters of John of Gaunt. She was thus a third cousin of her father-in-law and mother-in-law, Henry VII and his wife Elizabeth of York. Catherine has long had her admirers for the bravery and courage she displayed in contesting her divorce and fighting for her daughter's rights. She became a symbolic representation of the wronged woman. Shakespeare's co-written play Henry VIII presents her as a virtual saint, complete with the appearance of angels as she lies dying. However, she has also had her detractors. In 1860, the German historian G. A. Bergenroth said he believed that the universal praise of Catherine of Aragon needed "to be less." David Starkey is another modern historian who criticized Catherine in his book Six Wives but he insisted he had meant no disrespect, and argued that her tactics in political intrigue were a tribute to Catherine's intelligence. At the same time, Catherine's life and struggles have been portrayed in an impartial or more positive light by many historians. The American historian Garrett Mattingly wrote the popular biography Catherine of Aragon in 1942. In 1967, Mary M. Luke wrote the first book of her Tudor trilogy, Catherine the Queen which portrayed Catherine and the controversial era of English history she lived through from an impartial viewpoint. In recent years, the historian Alison Weir took a more sympathetic line with Catherine in her biography The Six Wives of Henry VIII. Antonia Fraser also covered Catherine extensively in her own 1992 biography of the same title. Modern historians are of the general opinion that neither Catherine nor Anne Boleyn were at fault for the roles they played during that turbulent time in English history. Both simply reacted to the circumstances in which they found themselves. The American feminist Karen Lindsey believes that the true culprit for Catherine's misery in her final years was her husband, Henry. Catherine's only surviving child, Mary, maintained her mother's Catholic religion throughout her life. She also reflected her mother's unwavering and determined nature in trying to maintain her position as rightful monarch. She was also known as Mary Tudor, Queen of England and of Ireland from July 6, 1553 (de jure) or July 19, 1553 (de facto) until her death. Lady Jane Grey, a cousin of Henry VIII, was made queen instead of Mary, but all support for the Lady Jane vanished as Mary rode into London triumphantly and unchallenged, with her half-sister, the Lady Elizabeth, at her side, on August 3, 1553. Lady Jane was beheaded by Queen Mary in retribution for claiming the throne. Mary, the fourth and second-to-last monarch of the Tudor dynasty, is remembered for her attempt to return England from Protestantism to Roman Catholicism. To this end, she had almost three hundred religious dissenters executed, including the Archbishop of Canterbury, Thomas Cranmer. As a consequence, she is often known as "Bloody Mary." Her religious policies, however, were in many cases reversed by her successor and half-sister, Elizabeth I (1558–1603). She was queen at a time of religious turbulence when kings and queens claimed the right to choose what religion their subjects would follow, a doctrine of which Martin Luther, the Protestant reformer, had approved. However, when a Protestant succeeded a Catholic or vice versa, and changed the nation's religion, chaos followed—since not everyone was prepared to follow the monarch on religion. Catherine was first portrayed on the silver screen in 1911 by Violet Vanburgh in a production of William Shakespeare's play Henry VIII. Nine years later, the German actress Hedwig Pauly-Winterstein played Catherine in the film Anna Boleyn. Later, actress Rosalie Crutchley played Catherine in The Sword and the Rose an account of Mary Tudor's romance with the Duke of Suffolk in 1515. Crutchley later played Henry's sixth queen Catherine Parr in The Six Wives of Henry VIII. It was not until 1969, in Hal B. Wallis's acclaimed movie Anne of the Thousand Days that Catherine appeared again. This time she was played by the Greek actress Irene Papas. A year later, in a 90-minute television drama produced by the BBC, British actress Annette Crosbie played the most historically accurate version of Catherine in a piece simply entitled Catherine of Aragon as part one in the channel's series The Six Wives of Henry VIII. In the 1973 film Henry VIII and his Six Wives, Frances Cuka played Catherine and Keith Michell reprized his role as Henry VIII. A scene was incorporated between Frances Cuka and Charlotte Rampling (playing Anne Boleyn) to show their quiet, glacial enmity. In 2003 Catherine appeared twice on British television. In January, Spanish actress Yolanda Vasquez made a brief appearance as the character in The Other Boleyn Girl, opposite Jared Harris as Henry VIII and Natascha McElhone as Mary Boleyn. In October, the ITV 2-part television drama, Henry VIII starred Ray Winstone in the title role and Assumpta Serna as Queen Catherine. Maria Doyle Kennedy portrayed the role in the 2007 Showtime television series The Tudors opposite Jonathan Rhys Meyers as Henry and Natalie Dormer as Anne Boleyn. The 2007 film adaptation of the novel The Other Boleyn Girl by Philippa Gregory stars Ana Torrent as Catherine, with Eric Bana as Henry, Scarlett Johansson as Mary Boleyn, and Natalie Portman as Anne Boleyn. There have also been several fictionalized versions of Catherine's story, including Catharine of Aragon, by historical romance author Jean Plaidy, and The Constant Princess, by Philippa Gregory. Also, for younger readers, Catherine's story is told in Patience, Princess Catherine by Carolyn Meyer. Although Catherine is often portrayed in film and on stage as having possessed the stereotypical Spanish traits of having dark hair and an olive complexion, Catherine was in fact a gray- or blue-eyed, fair-skinned woman with reddish-blonde hair, not too unusual for northern Spaniards such as those from her father's land of Aragon. Furthermore, Catherine herself was part English, through her English great-grandmother, Catherine of Lancaster. 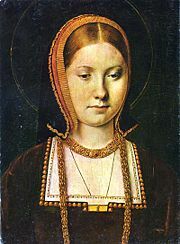 The most common spelling of her name is "Catherine of Aragon" although it has been spelled a variety of different ways. The Spanish spelling is "Catalina." The Oxford Dictionary of National Biography states that her name should be spelled "Katherine" in a professional publication: "Catalina, or Katherine, as her name was invariably spelled in England in accordance with contemporary usage." In most official documents, her name is spelled with a K.
The Catholic Encyclopedia, Henry VIII – www.newadvent.org. History of "Catherine of Aragon"
This page was last modified on 19 January 2017, at 16:26.